And thus the season ends. 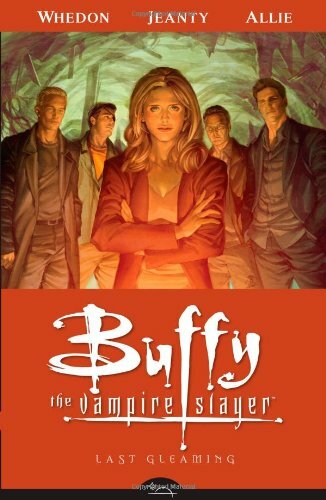 I found this a fairly satisfactory ending, especially with regards to the Buffy/Spike storyline, but there were so many loose ends, answers not given etc. I assume they may be saving this information for a future graphic novel season, but I had hoped for more closure. Regarding the season overall, I am both pleased and disappointed. I am pleased that I now know what happened when the TV show finished, but there were quite a few elements in these graphic novels that I wasn’t so impressed with. On TV, despite being a fantasy show, the story always felt real, whereas some of the things that happened in these graphic novels were farfetched and ridiculous. Some aspects of the plot seemed to be pure sensationalism and were out of character in my opinion. Some volumes were good and the story worked well in them, but in other instalments the story seemed to drop out completely and we were left with irrelevant filler. That said, I might be intrigued enough to read on if future books are released, but this is not going to be to everyone’s taste. This is definitely only for die-hard Buffy fans. If you were someone who was content with the ending of season seven, I wouldn’t recommend giving this a try as it may disappoint.